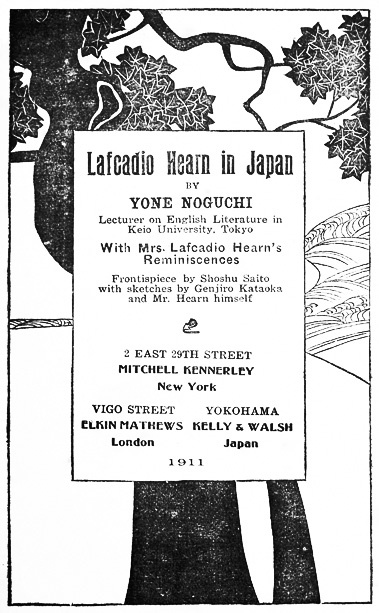 In late September 1904, a few weeks after his return to Japan after eleven years abroad, Yone Noguchi attempted to visit Lafcadio Hearn's office at Waseda University. However, Hearn had died several days earlier, and Noguchi could only attend his funeral. Because of their similar roles as interpreter of Japanese culture to English readers, and as professors of English literature at Japanese universities, Noguchi felt a deep connection with Hearn. This connection was strengthened by Noguchi's subsequent friendships with Hearn's widow and with many of Hearn's former students. Lafcadio Hearn in Japan draws on those friendships, and on Hearn's own relationships with his family and students, who "observed him under many different shades," as Noguchi says. This electronic text is based on the 1911 edition, published by Noguchi's Valley Press in Kamakura under arrangement with Kennerley, Mathews, and Kelly & Walsh. The first edition had appeared in 1910 without the Kennerley arrangement. The appendix and some of the illustrations are omitted at this time. This electronic edition ©2005 by Edward Marx. Special thanks to Nanae Tamura, Shizuko Watanabe, and Hiromi Ito from the Matsuyama Kaguyahime group.